A celebration of Punk Rock in an Irish town. The project examines the roots and dynamics of oppositional culture and the legacy of dissent as a mode of practice. How effective was the transmission of criticality through the popular youth culture of the 1970’s? In post–industrial Ireland the dynamics of power have shifted from church and state to the media and private investors. How might these power relations be shifted to accommodate the needs of the social rather than the professional classes? What might a cultural revolution really look like, the Military spectacle of the 1916 massacre or the bin bag parades of mobilized dissidents? Saturday the 27th of August will see the launch of the publication ‘Subvert All Power’ Drogheda’s Punk History, in the theatre space of the Droichead Arts Centre. A number of presentations will take place from 3 o’ clock to 5 o’clock. Orla Ryan, artist, writer and educator will discus feminist punk culture as it emerged in the 70’s and its influence. There will be presentation by artist Nigel Rolf who created ‘Dark Space’ a 24 hour punk gig in 1979 as a socially engaged and expanded performance. Dave Lordan activist and poet will unpack his epic articulations of the confusion and helplessness of economic meltdown, through his wry, intense evocations of people, places and circumstances, and Paddy Dillon takes his action of disrupting Sunday morning mass in Drogheda in the early 80’s with a clutch of hens as the impetus for his new performance. Excerpts of interviews with Drogheda punks will be available to hear and Brian Hegarty (thirty three-45 ) will have some vinyl records for you to peruse. 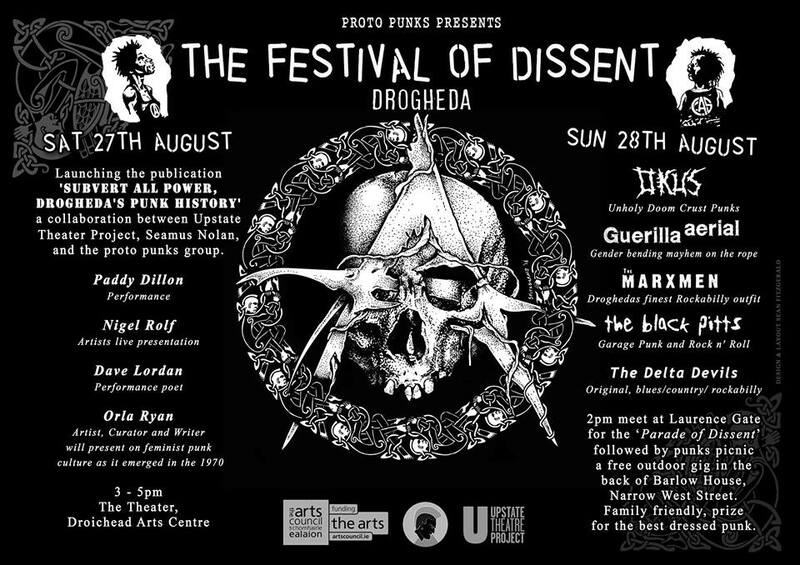 Sunday the 28th, meeting at Laurences Gate at 2 o’clock the Parade of Dissent including banners, madzers and music will make its way through the streets to Barlow House where Drogheda’s latest ‘punks’ picnic’ will take place. Drogheda bands influenced by Punk will perform a free open air concert for the afternoon. ‘The Delta Devils’, playing original blues / country, rockabilly. Garage punk band ‘The Black Pitts’ and ‘The Marxmen’, Droghedas authentic rock n’ roll outfit will be followed by the ambiguous antics of ‘Guerrilla Aerial’ all topped off with the unholy doom crust punk that is ‘OKUS’.